CBTB is situated just 50’ from the waters of Mobile Bay. The house is perfect for small families, a group of friends, a couple, or just someone looking to get away from it all. Boater? Boat launch is 2 minute drive. Can’t get enough of white sandy beaches? The Gulf of Mexico is .75 miles away. Foodie? Walk across the street to The Beach Club, take a short drive to Sassy Bass or drive to Gulf Shores for an amazing range of places. License to chill? 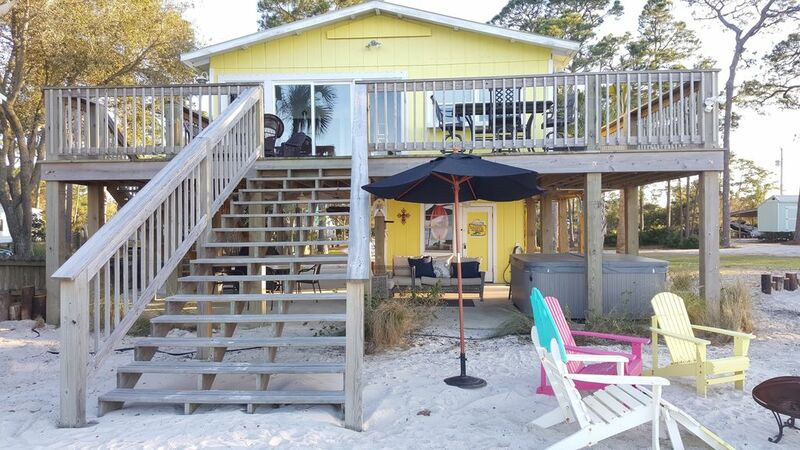 Stay at the cottage and enjoy incredible sunsets from the large deck that overlooks Mobile Bay, grill some dinner or enjoy your time on your own private sandy beach. CBTB has recently been renovated. It is comfortable and updated, but still retains the old charm that only comes from a place that has been around for over five decades. The kitchen is open to the living room. The living room includes a large TV, a bed nook perfect for reading or naps, and full wall windows/patio doors to keep the view always close. toilet, tub, shower, You won't get lost in this bathroom! CBTB is located on the Mobile Bay across the street from the Gulf of Mexico. Each room has its own thermostat for customized comfort! Keurig, so bring your cups. Small, but it works well. Wheelchairs are welcome, but lots of steps. On the deck only! Zero smoking in the house. CBTB is a perfect spot for a quiet getaway, just far enough away from the tourist attractions of Gulf Shores. The cottage has everything you need to relax, kitchen is well stocked for cooking. Saw herons, pelicans, cormorants, bluebirds, owls but the highlight was having dolphins swimming right off the dock! Nature preserve and several public beaches are very close. Our pup loved the deck, beaches and trails, too. Great spot, hope to be back soon! The rental was a very clean cozy 2 bedroom, 1 bath home. The beds were very comfortable. The kitchen was well stocked with everything we needed. The view is gorgeous. The rental has a lovely deck and dock so if you bring your boat you can tie it up right in front of the place. There is a hot tub, grill, and outdoor seating. The large washer and dryer are brand new. Although it is away from the busy areas, it was close enough that we could eat out often with a 15 to 20 minute drive to Gulf Shores where my husband could find shrimp, shrimp, and more shrimp. In Gulf Shores you can find anything you need. We went for hikes, visited Fort Morgan, and saw the zoo in Gulf Shores. We spent a lovely week there. Perfect for me and the dog! This place is fabulous. Water front with public beach very close. Golf courses everywhere. Great food across the street within walking distance. Away from the craziness that’s closer to town. Everything I needed was just a few short miles away. I couldn’t have been happier! house was great. location was great. beach nearby was wonderful. bring some bug spray if you want to sit outside at night but I think this is true at almost any beach location. overall, I would definitely stay here again. My sisters and I stayed for the Labor Day weekend. The house was perfect for us. The full-sized appliances made everything so easy. The small gas grill downstairs was perfect for our burgers. My favorite two spots were the swing under the house and the reading nook inside. The proximity to the water and the new dock makes this location ideal for anyone who doesn't want to walk too far to get to water. We saw dolphins twice! The pelicans were magestic! We had lots of rain, so my only disappointment was that neither of the outside stairways have a covering so we could get into or out of the house when our arms were full without getting wet. However, this did not dampen (pun intended) our enjoyment of our stay. We, and our puppies, really had a restful weekend. Thank you for sharing your home. A rental agreement along with a copy of your driver license and front & back of the credit card used to book the reservation is required prior to the final confirmation of the booking. This property will accommodate small parties and events. They MUST be approved in your rental agreement. There will be a non-refundable damage deposit with parties, events, and anything over the number agreed in the rental agreement. Contact the owners for more information. We are not absentee owners. Need something during your stay? We should be able to handle it quickly.